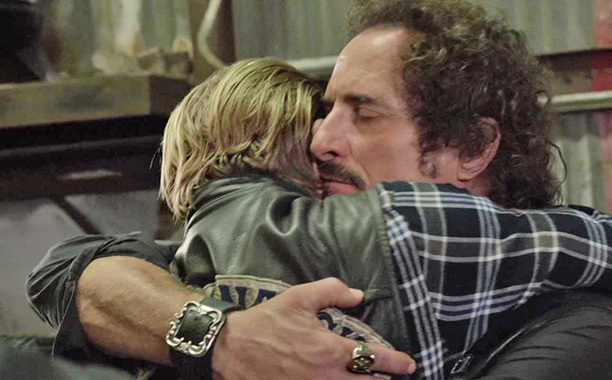 7x13 - Papa's Goods - Jax and Tig. Charlie Hunnam as Jax and Kim Coates as Tig in Papa's Goods (7x13). Wallpaper and background images in the सन्स ऑफ अनार्की club tagged: photo sons of anarchy still season 7 2014 7x13 series finale papa's goods charlie hunnam kim coates jax tig. This सन्स ऑफ अनार्की photo might contain भोजन करनेवाला, डिनर, हस्ताक्षर, पोस्टर, पाठ, चॉकबोर्ड, साइन, साइन इन करें, सड़क, शहर के दृश्य, शहरी सेटिंग, शहर दृश्य, and शहरी की स्थापना.